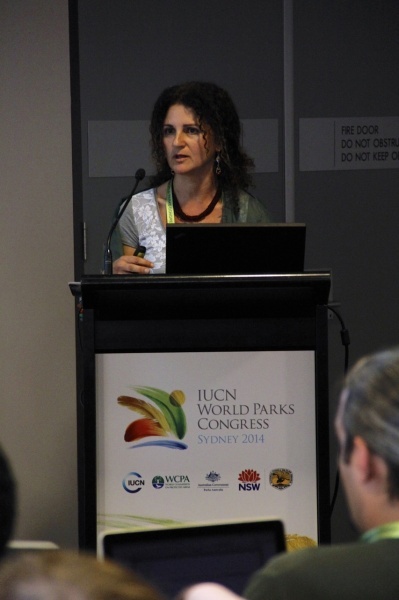 The United Nations University Institute for the Advanced Study of Sustainability (UNU-IAS), serving as the host of the Secretariat of the International Partnership for the Satoyama Initiative (IPSI), organized a side event to the IUCN World Parks Congress 2014 in Sydney, Australia in the evening of 17 November 2014. The event was titled “Production Landscapes and Protected Areas: Approaches of the Satoyama Initiative”, and featured presentations by several members of the IPSI partnership and others involved with landscape and seascape approaches and their relation to issues faced in the planning and management of protected areas. It also served as the official launch of a new publication, “Toolkit for the Indicators of Resilience in Socio-Ecological Production Landscapes and Seascapes”. The event was opened by the staff of the IPSI Secretariat, followed by a keynote speech by Prof. Kazuhiko Takeuchi, Senior Vice-Rector of the United Nations University. Prof. Takeuchi, who has been instrumental in the establishment of the Satoyama Initiative, focused primarily on the Initiative’s relationship with protected areas, pointing out the various types of both production areas and protected areas and where they overlap, and the mutual benefits they can get from each other. He provided examples of production activities inside and around protected areas from Vietnam, China and Japan to show how production areas can not only mitigate impacts on important ecosystems in protected areas but also become part of a larger holistic system encompassing social aspects in conservation, and stressed that holistic and innovative approaches are needed especially with shifting expectations for protected areas in the modern world. A brief Q & A session followed the keynote speech, with audience members wondering about Satoyama Initiative concepts as they relate to disaster recovery efforts, and financial mechanisms behind activities carried out under the Initiative. It was also pointed out that there is still a great deal of debate about whether it is even appropriate for production activities to happen in protected areas. Prof. Takeuchi pointed out that the models he presented in his speech can serve as good models for mutual benefits, but there is still a need for more science to be done to provide a solid scientific background. Ms. Ayako Kawai of the IPSI Secretariat gave a presentation introducing the Satoyama Initiative and IPSI, after which co-facilitator Ms. Yoko Watanabe from the GEF Secretariat took over the proceedings. Ms. Watanabe discussed how the Satoyama Initiative ties well into the discussions at the World Parks Congress, in particular the emerging need to look beyond a simple vision of “parks” and rather consider protected areas within a larger overall vision of resource use. 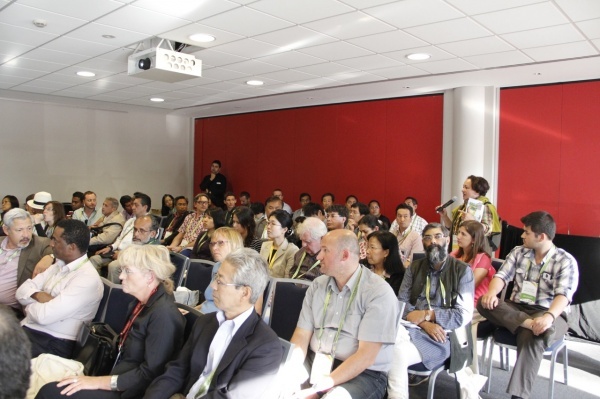 She also drew connections between the Initiative and the many issues related to indigenous peoples raised at the Congress, as evidenced by the ICCA Consortium’s Gathering of Communities held immediately before the Congress in Katoomba in the Blue Mountains outside of Sydney. Mr. Jairo Diaz, Executive Director of the Foundation for Research and Social Development (FIDES) in Ecuador, spoke next on “Local Communities’ Establishment of Sustainable Production Landscapes in Mangrove Ecosystems in Manabi, Ecuador”. Mr. Diaz gave a detailed introduction to local communities that rely on mangroves on the coast, the benefits they derive from the mangroves, and threats from deforestation and unsustainable use by the shrimp industry. He then discussed some of the efforts being undertaken to protect and restore the mangroves, including education, youth programs, tourism, alternative livelihoods and organizing to influence policy. The next speaker was Ms. Nadia Bergamini, a Scientific Assistant at Bioversity International, who introduced the new publication, a “Toolkit for the Indicators of Resilience in Socio-Ecological Production Landscapes and Seascapes”, which was created through an IPSI Collaborative Activity carried out by Bioversity International, the Institute for Global Environmental Strategies (IGES), UNDP-COMDEKS, and UNU-IAS. She described the background of the project and how it led to the content of each chapter of the Toolkit, including lessons learned from workshops held around the world, and then presented a case study from Fiji as an example of how to use the publication. 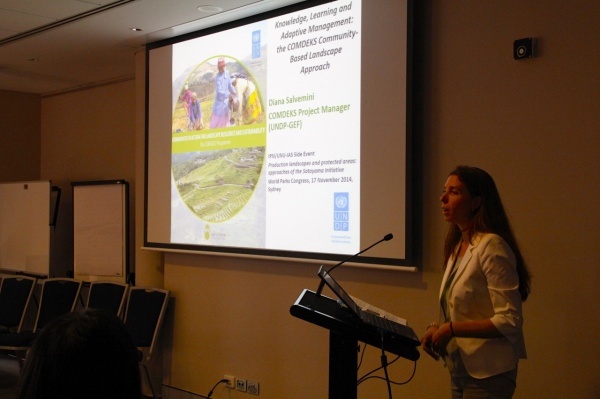 Ms. Diana Salvemini, Project Manager of the Community Development and Knowledge Management for the Satoyama Initiative (COMDEKS) Programme at UNDP, gave the next presentation, titled “Knowledge, Learning and Adaptive Management: the COMDEKS Community-Based Landscape Approach”. Ms Salvemini gave an overall view of the small grant funding managed by the COMDEKS Programme and its implementation in twenty countries around the world. She also explained UNDP’s role in the development and use of the Indicators of Resilience and the new Toolkit publication, using the COMDEKS project in the Datça-Bozburun Peninsula in Turkey and its development of an integrated landscape management strategy as an example. 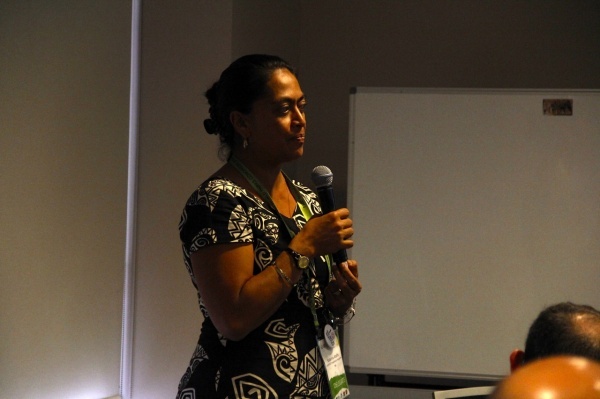 A brief response to the presentations came from the floor now, given by Ms. Katarina Atalifo, the COMDEKS National Coordinator in Fiji, who spoke of her actual experiences implementing the Indicators as part of the programme. She stressed the challenge and necessity of translating the Indicators, particularly some unfamiliar terms used, but also noted that the communities where they were used showed a lot of appreciation for them as a tool to assess their own situation in ways they had not thought of before. 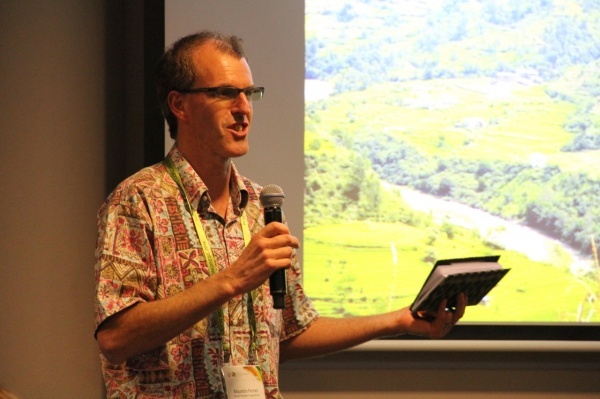 The other co-facilitator, Dr. Maurizio Farhan Ferrari, Coordinator of the Environmental Governance Programme at the Forest Peoples Programme, took over the proceedings for the following panel discussion. Many of the audience’s interests in the panel discussion had to do with the Indicators of Resilience and their broader applicability beyond the local communities that the Toolkit is designed for and in other processes. Panelists noted that local-level indicators like these ones are relevant to higher-level indicator frameworks in that they can provide valuable input regarding local, cultural and other perspectives that broader and more quantitative indicators cannot capture, so both approaches are necessary and complementary. It was also suggested that the indicator framework is designed to be flexible and does not prevent practitioners from using it along with other types of indicators that may be relevant to the local context. Cultural aspects of biodiversity were among the main topics among most of those participating in the panel discussion. Participants pointed out that the need to address cultural aspects was one of the lessons learned from the field-testing of the indicators, and that they were actually revised based on this testing to meet this need better. One of the advantages mentioned of the indicator approach at the landscape or seascape level is that many other approaches tend to break up resources based on ecosystem type while ignoring the cultural basis that brings everything seen as a resource in an area together, so the fact that this basis is included in these indicators may help to stop outside entities from exploiting separated resources and ensure fair access for local stakeholders. This discussion was quite active, and the time limit was reached and then surpassed even as it was going on. Dr. Ferrari brought the proceedings to a close with comments that the very positive response to the indicators shows how IPSI activities are relevant to various processes such as the World Parks Congress, the upcoming Sustainable Development Goals, etc. He finally brought it back to the main topic of the Satoyama Initiative’s relevance to protected areas, saying that the Initiative can help to resolve the current underrepresentation of cultural and equity-related issues in national and international processes, and continue to play a role in achieving a number of the Aichi Biodiversity Targets among others.